The Drahthaar is a very versatile hunting dog who can hunt any game on any type of terrain and even retrieve items from land or water. With his excellent nose and stamina, this dog is a perfect companion to hunters and active families. Drahthaars are sporting dogs due to how fast and strong they are. They are a medium-sized dog, growing from one foot, ten inches to two feet, two inches at the shoulder. They usually weigh sixty to seventy pounds, making them a pretty solid dog. Like most dogs, Drahthaars can live a long life of twelve to fourteen years if they are properly taken care of. 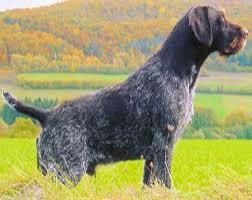 In the late 1800s, German hunters were in need of a strong dog who could hunt any type of game on any type of terrain. 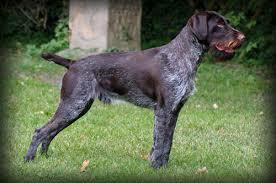 With this, they created the German Wirehaired Pointer, or the Drahthaar. To make this dog, the Germans blended the best qualities of the Pointer, Poodle, and Foxhound breeds to develop a dog that could retrieve items on land and in water, no matter what the environment or the weather. After his creation, the Drahthaar was admitted into the German Kartell for dogs in 1928 and was then brought to the United States in the 1920s. In 1953, the German Drahthaar Club of America was formed, making the Drahthaar a true staple in the American household. The Drahthaar is very loyal and affectionate to his family and people he knows, but can be tough with strangers. It is common for a Drahthaar to have a favorite person in his family. The Drahthaar is all about family because of how much he loves human companionship which makes him a great household dog as well as a good guard dog. With this, it is important to realize that a Drahthaar can be possessive and possibly act aggressive towards things that he might find strange or threatening; he will do anything to guard his family. Drahthaars can become bored rather easily so it is very important to exercise your Drahthaar and make sure that they are getting enough time outside play time. Drahthaars have a strong desire to please so it is not very difficult to train them using a reward system but it is important to make sure that the Drahthaar knows that humans are in charge or they might try to dominate the household and other animals. As always, it is essential to socialize a Drahthaar as early as possible to make them less aggressive as they age. Because it is the Christmas season, here is a video of a child getting the best gift in the world: a puppy! Remember that there are always so many dogs that need happy families to get adopted into. If you are interested in a Drahthaar for your family or friends, then check out all of these amazing dogs up for adoption! 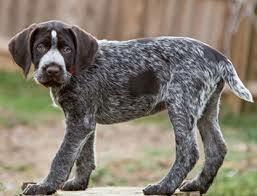 Even if you just want to help these dogs, check out the National German Wirehaired Pointer Rescue anyway! I am an animal lover, specifically dogs, myself and I think your blog is amazing. There are so many dogs suffering because they can’t find loving homes. I think it is horrible how many animal abuse cases there are involving dogs and being mistreated by their owners. I think your blog is an amazing idea and your writing style really demonstrates your passion on the subject. Great job! Peggy I am so sad for this semester to end because I have truly enjoyed your blog about dogs. I think the adventurous nature of this final dog is fitting for your unique approach to these passion blogs. The video at the end was so cute! I can’t wait to get back and spend some time with my not so big dogs. I always appreciate how you mention dogs that are currently up for adoption. This is truly in the nature of the holiday season and always important to highlight. There are few things that bring me as much joy as dogs. That being said, your blog has been a great source of happiness for me and I will miss it dearly. These dogs in particular are lovely cause the one picture makes it look like the dog has a kind of red bears. Adorable. Also, I love how fit these dogs are because it means they are perfect for lots of playing. They certainly won’t get tired before you do!! I must say overall, I think I preferred the corgis you posted about to these, but that by no means I’m not a fan of these cute little guys! Great post Peggy! I wish you told us how to pronouce Drahthaar! It honestly sounds like some sort of dragon. I guess it’s fitting, since those dogs are so strong. I like how you tied in Christmas with this post. This is an awesome blog because it is super interesting to learn how all of these dogs have come about, and the main the reason for why they were created. I also love dogs, so any extra chance I get to look at these cute pups makes my day 10 times better! Awesome post! I particularly enjoyed the history of the Drahthaar in Germany and America. I have many ancestors who emigrated from Germany, and now I wonder if they had any Drahthaars while growing up there. 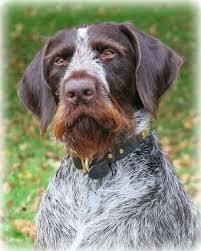 It’s also interesting to see the different dog breeds that make up the Drahthaar. While I can definitely see the influence of the Pointer and the Foxhound, I would not have guessed the Drahthaar was part Poodle before you told me. Wonderful post!